Qu’en est-il de la situation socio-politique : 20 ans après le Référendum sur la souveraineté au Québec ? Quebec University Professor Gerard Bouchard will be visiting Japan in December and will give some seminars on December 9(Sun) and 10(Monday). "There have long been pros and cons regarding the safety of nuclear power at home and abroad. Now it is apparent that Japan’s nuclear crisis is seriously impacting nuclear energy policies all around the world, as the Fukushima nuclear accident has raised concerns over the safety of nuclear power plants and invigorated “anti-nuclear power” movements not only in Japan but also in other major countries.......... Given all these developments in the aftermath of the Fukushima nuclear accident, we are now at a crucial crossroads to choose between the pro-nuclear and the anti-nuclear paths, where the former is to develop much safer nuclear reactors with stronger safety systems while maintaining reasonable scientific attitudes toward the effects of radiation, and the latter is not only to accept the first basis premise of the anti-nuclear argument about accident-prone nuclear power plants but also to buy at their face value the other key premises about the “serious” effects of radiation in the case of a nuclear accident. Hopefully, Japan can find strong leadership to lead us in the right direction at this critical juncture." "Horrifying news headlines on Japan’s nuclear crisis have been appearing in both the Japanese and foreign media for the last couple of weeks. People naturally worry if they read such headlines as “Tokyo water ‘unfit for babies’ due to high radiation” and “Radioactive levels in sea 1250 times higher than the safely limit"................ As far as the reality outside of the immediate vicinities of the damaged nuclear reactors is concerned, however, what is not mentioned in those media headlines or in any part of the reports themselves is the fact that Japan’s guideline values by which the degree of safety and risk for human health is measured are overly conservative, that is, much stricter than internationally accepted standards........... Now that there has been so much misunderstanding and confusion among the general public at home and abroad, the Japanese government seems to be taking a step to review its guidelines and possibly revise it in line with the internationally accepted standards for radiation safety (see the links below). Hopefully, this will be done before the government’s misleading statements and misguided decisions on radiation “contamination” become the fourth disaster following the trio of the massive earthquake, tsunami and nuclear accidents in Japan." "There has been a striking discrepancy among outside views of Japan’s current crisis and future prospects following the trio of major disasters that it confronted in the past week............. First, the nuclear plant problem in Fukushima is fundamentally different from the case of the Chernobyl meltdown. It might even be said that the worst is already over in Japan, because all the nuclear reactors in Fukushima were completely shut down immediately after the March 11 earthquake thanks to automatic safety devices, unlike the Chernobyl disaster, where reactors were not shut down and actually exploded. So, the current problem in Fukushima is not how to prevent a possible nuclear explosion like Chernobyl, but how to cool down the inactive reactors containing the still hot nuclear cores as well as the spent fuel rods in the pools in order to prevent radioactive materials from being exposed to the open air, which might happen if no cooling system works.............Second, the damage to the Japanese economy seems far less than expected by those who predicted the decline or even collapse of the economy. A good reference point is the damage caused by the Great Hanshin earthquake of 1995 which was recorded at a magnitude of about 7.0 and which led to a death toll of about 6,500. In contrast, the earthquake this time was recorded at about 9.0, and may lead to a death toll that reaches 18,000. From these gross figures, a reasonable projection of the economic damage to Japan’s economy could then be perhaps two to three times that of the Great Hanshin earthquake. For the earlier case, the official estimate of the economic cost, made by the Hyogo prefectural government in Japan, is about 10 trillion yen (US$120 billion). One might suggest, therefore, that the total economic cost of the recent, massive earthquake could be as high as 30 trillion yen, a figure that is twice the value estimated by most major think tanks in Japan and the US. However, even this level is equal to only about 6% of Japan’s GDP, and is less than 3% of the total value of the financial assets held by Japanese households as a whole. Such costs, while substantial, are hardly likely to lead to economic stagnation, let alone a collapse of the Japanese economy." 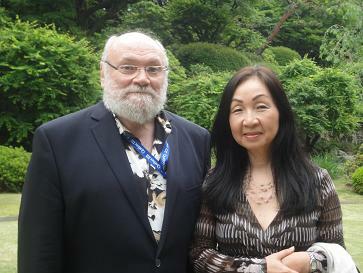 It has just been announced that Dr. Claude-Yves Charron has been appointed as the new Quebec Government Representative in Tokyo. The following are my interviews with Dr. Charron in Quebec. M. Tachibana a poursuivi des études pour l’obtention de la maîtrise et du doctorat en littérature française à l’Université Waseda, au Japon. Il a obtenu un diplôme d’études approfondies en littérature française à l’Université Sorbonne Nouvelle – Paris 3. Le professeur Tachibana se révèle comme le plus ardent défenseur de la francophonie au Japon et manifeste une prédilection pour la culture des Antilles et celle du Québec. Ainsi, en plus d’enseigner la langue et la littérature françaises à l’Université Waseda, il effectue des recherches de haut niveau sur les littératures francophones. M. Hidehiro Tachibana est l’un des rares Japonais francophiles qui ont acquis une connaissance étendue du Québec et de la littérature francophone d’Amérique.